I did not win the Woolworths soup competition even though I thought the recipe was amazing. Laura at Woolworths tells me it may be because it is too similar to what they already have on the shelf. I chose to make a beef short rib and carrot soup and not only did it taste good, it looked great in the soup packaging. I am hoping that these lamb burgers are a better entry (read winning) as this time I did a bit more in store research. Our local Woolworths in Somerset West only stocks beef burgers and ostrich burgers. We have been told in the competition brief that there are also boerewors (sausage) burgers but I have never seen them. I love lamb and so chose leg as the cut of meat I would use to make a burger patty. As this is a Woolworths competition, I have only used ingredients sourced from my local store. However, they are common ingredients and should be readily available around the world. I think they may be too expensive but thanks! They do sound good. I hope you win. I do whole leg of lamb with garlic, anchovies and rosemary. It’s an astonishingly good combination. would send some over if I could! Love lamb and bet these would be so tasty – good luck to you with the competition! Good luck with your lamb though! Good luck with the competition…they sound like a winner to me. good luck! this sounds like a winner to me! I like your combination of flavors and the use of the lemon oil and anchovies give this a very Mediterranean feel. I love all the Woolies competitions – one day I shall enter – I will put Jessica on a bun… haha 🙂 She is so edibly cute! 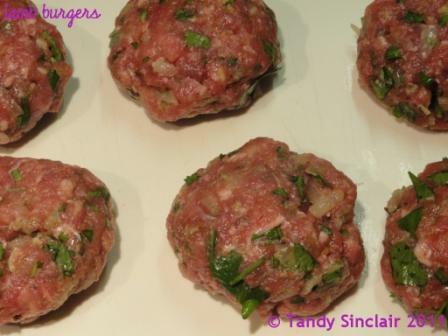 Lovely burgers – sounds like a winner to me! With the price of legs of lamb, not sure I could bring myself to use it for burgers – I wonder if another cut would work as well? I love that you added anchovies – they must have added such wonderful flavour. I am sure it will work well with any cut, as long as it is not too fatty! that is way over the top! Yum! Lamb burgers sound tasty!